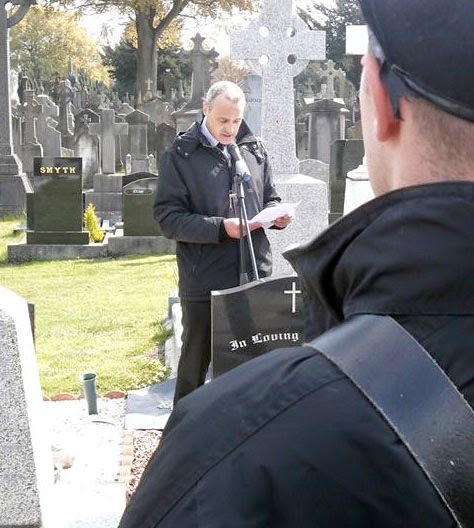 Republicans gathered in Glasnevin Cemetery and led by a Dublin Colour Party marched to Ronan's graveside where proceedings were chaired by Val Lynch and the main oration was delived by Colin Keating. republican leader would label Volunteer Ronan McLoughlin a traitor to Ireland. are the true heirs of Redmond’s Home Rulers. upon us. It is a momentous occasion for many reasons. rights at the heart of the nation. change to enable that vision become a reality. remains one and the same. Dublin can be very proud of its republican history. counterparts today at every opportunity. The most effective response to this tirade is discipline. can help in this task. as through them will be found the path to the Republic. the living issues which affect our people daily. issues which Connolly urges us to address. realising the aims for which he gave his life. Beir Bua!